Question Evolution! : Evolutionists, start thinking the "unthinkable"
The Birkbeck College, University of London professor Eric Kaufmann using a multitude of demographic studies argues in an academic paper entitled Shall the Religious Inherit the Earth? Demography and Politics in the Twenty-First Century the decline of atheism in terms of its global adherents is an established trend that will persist for the foreseeable future and the rate of decline will accelerate and affect the Western World. See: Why are the years 2012 and 2020 key years for Christian creationists and pro-lifers? In the videos below, which feature Professor Kaufmann speaking with other secular minded people, the subject of evolutionism is briefly brought up. You will notice that the discussions become very uncomfortable. Specifically, in both videos the subject of whether or not the growing number of Bible believing Christians and other religious conservatives will launch anti-Darwinism efforts in the future and prevail. Of course, in one video the strawman "argument" of science and technology ending if evolutionary belief disappears is briefly brought up, despite the fact the Europe had a scientific revolution before Darwinism was in existence and that many of the founding fathers of modern science were Bible-believing Christians. Let me make this clear. After having evolutionism force fed to students in public high schools for approximately 50 years, it is unrealistic to believe that a sufficiently large national creationist majority in Western countries is going to continue this policy. This is especially true since non-Darwinists in academia have been harassed by Darwinists. Once evolutionary teaching is taken out of public primary and secondary education (high schools) in the West, Darwinism will largely collapse. A conservative religious public may insist that public universities and all public institutions not promote the evolutionary paradigm on the public's dime as well. Once either or both of these occur, the secular religions of atheism and agnosticism and theologically liberal religion will face even more rapid declines in the world. In the United States, American government run public schools which teach evolution are increasingly facing budget cuts and there is increasing criticism of public schools in terms of their quality. Vouchers for private schools (including religious schools) and charter schools are increasingly being discussed and legislators are introducing and passing school choice bills. In addition, the Washington Post reported that in the United States school budget cuts are forcing more public school districts to four-day weeks. Given the Eurozone debt crisis similar measures could be taken in secular Europe. Increasingly, parents are homeschooling their children as well. Atheists, agnostics, deists and theologically liberal theists need to start thinking the "unthinkable". Religious conservatives in the Abrahamic faiths are not going to continue to be forced to support the religion of Darwinism once they are in a position to end this practice. In fact, given the pseudoscientific nature of evolutionary belief, religious conservatives may widely spread through their cultures how preposterous Darwinism was and how it hindered scientific progress. In addition, children may widely learn how Darwinian thinking lead to mass murder (Nazi evolutionary racism, communism, eugenics, abortion, etc). We are committed to helping make 2012 be the worst year in the history of Darwinism. A grassroots approach is key to defeating evolutionary indoctrination and the group of Christians that is willing to rapidly and strongly advance an anti-evolution grassroots campaign will have a devastating and lethal impact on Darwinism. 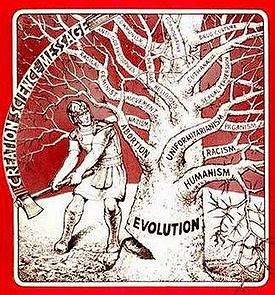 Let's create a proliferation of creationist grassroots fires across the globe designed to burn down the wood, stubble and hay of evolutionism. Evolutionists will be unable to stamp out these fires using their strong arm tactics as they will merely fan the flames of resistance. The Question Evolution! Campaign can certainly serve as a strong catalyst for the continued shrinking of global atheism plus assist in the current explosive growth of Christianity. The timing is excellent for our grassroots campaign! Let us confidently move forward and achieve many victories for Christianity and the biblical creation cause.